According to the Wolf Foundation, Mostow’s strong rigidity theorems are some of the greatest achievements in mathematics in the second half of the 20th century. Courtesy of Mary Ellen DelVecchio. 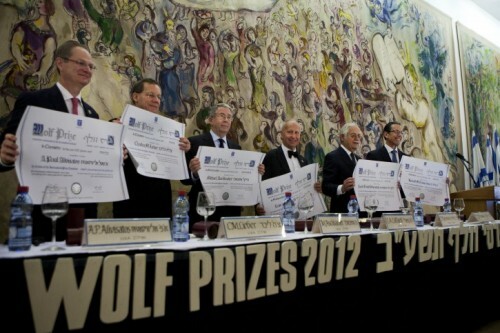 Winners of the 2012 Wolf Prize display their awards in the Knesset in Jerusalem, where this year’s ceremony will also be held. Courtesy of VIN News. Mostow is renowned for his contributions to geometry and Lie group theory, particularly for the Mostow Strong Rigidity Theorem. This theorem states that any spaces of greater than two dimensions with local central symmetries at all points, negative curvature, and isomorphic Poincare groups are globally congruent. Since the publication of the theorem in 1968, it has continued to be used by many researchers. 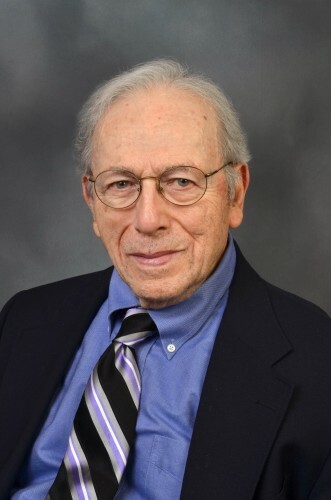 Mostow joined the Yale faculty in 1961 and taught undergraduate and graduate courses before receiving emeritus status in 1998. Throughout his teaching career, he emphasized that even the most complicated mathematics evolves from a simple idea, and led his students to see the unity among the different branches of mathematics. Mostow continues to attend seminars and conduct research. The Mostow Strong Rigidity Theorem, first introduced in 1968, continues to be used by researchers in many different disciplines. Courtesy of Princeton University Press. Mostow will split the $100,000 prize with Michael Artin of MIT, who works on algebraic geometry. The Wolf Foundation Prize has been awarded most years since 1978 for achievements in the interest of mankind. Courtesy of New York University.